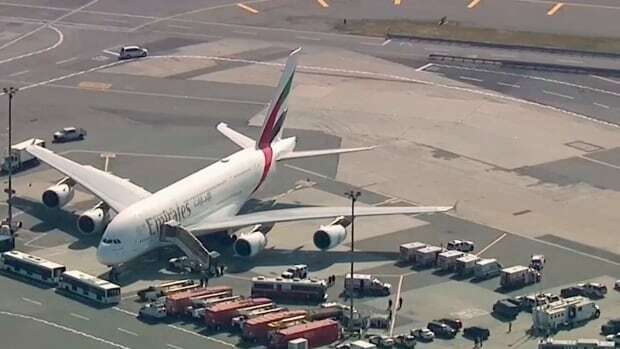 Some 100 passengers and crew reported feeling ill on Wednesday during an Emirates flight from Dubai to New York City, and health workers were evaluating them as the airplane sat on the tarmac of JFK International Airport, authorities said. Emirates Flight 203 landed with at least 521 passengers shortly after 9 a.m. ET, with passengers complaining of symptoms including cough and fever. Earlier, Dubai-based Emirates said in a statement that 10 passengers "were taken ill" on the flight from the Middle East and were transported to hospital. It did not specify the symptoms or nature of the complaints. White House spokesperson Sarah Sanders said they were monitoring the situation and President Donald Trump was being updated as new information became available. The airplane is a double-deck Airbus A380 — the world's largest passenger aircraft — according to FlightAware.com. Public health officers with the U.S. Centers for Disease Control and Preventionwere working with other agencies to evaluate passengers, including taking temperatures and making arrangements for transport to hospitals, spokesperson Benjamin Haynes said in the statement. Passengers who were not ill were allowed to continue with their travel plans, he said. Some sick passengers were taken to Jamaica Hospital Medical Centre with non-life-threatening conditions, according to a New York City Fire Department spokesperson. Coben tweeted that he and a number of other passengers were eventually allowed to leave the plane after filling out a form from the CDC. They had their temperatures taken on the tarmac and were then transported by bus to the airport terminal, where they made their way through customs. Eric Phillips, a spokesperson for de Blasio, tweeted that the flight stopped in Mecca, which is experiencing a flu outbreak, and "early indications point to that as a possibility." A New York Police Department counterterrorism division tweeted it was monitoring what appeared to be a "medical situation."